San Francisco, March 04, 2015 - InMobi, the world’s most powerful mobile advertising platform for developers, today announced the launch of Appographic Targeting™, an industry-first, app-interest-based audience targeting capability. Appographic Targeting™ helps app marketers promote apps to users based on their unique app interests. It leverages audience insights that go beyond app ownership and app category, and has potentially delivered up to 72% higher install rates, 26% lower Cost-per-Install (CPI) and 30% higher consumer Lifetime Value (LTV) on app promotion campaigns. 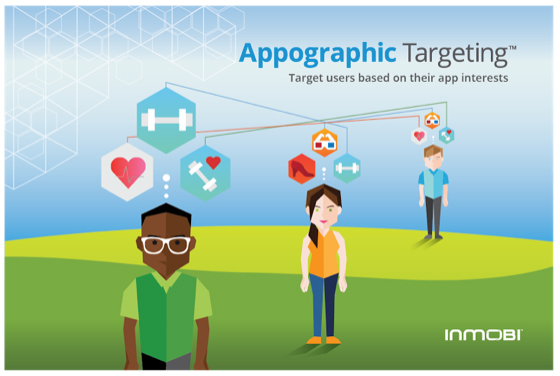 Appographic Targeting™ is based on InMobi's analysis of over ten thousand apps on the app store to identify the core elements that define a given app. These functional, design and interactive elements, identified by InMobi, transcend app categories like gaming, social, entertainment, travel and commerce. 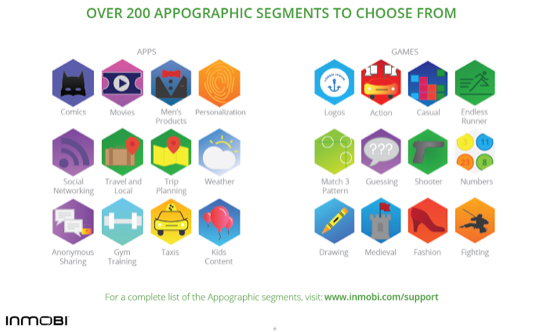 Based on these elements, the InMobi audience comprising one billion unique mobile devices has been categorized into 200 Appographic segments. Marketers can now utilize these segments for sharper targeting of app-install campaigns. A flight booking app can now also be promoted to users who engage with apps that offer trip planning, hotel booking, holiday packages or travel reviews. Similarly, a shopping app can be promoted to users who engage with other apps that offer any type of deals and discounts, sell men's or women's apparel, or apps that sell specific products like books and shoes. A mid-core game can be promoted to users who enjoy apps that are based on city construction, clan-battle or medieval themes. App marketers have traditionally targeted users based on device ownership, location data and content affinity. However, research by InMobi shows that app users tend to use apps whose similarities are not necessarily limited to categories only in the app store. By targeting audiences based on their app interests, marketers can now maximize install-rates as well as user lifetime value. InMobi is the world’s most powerful mobile advertising platform enabling brands, developers, and publishers to engage mobile consumers globally. Recognized by MIT Technology Review as one of the 50 Most Disruptive Companies, InMobi reaches over 1 billion mobile uniques across 200 countries. Visit www.inmobi.com or follow us on Twitter @InMobi. Developers, start monetizing today by downloading our SDK at www.inmobi.com/products/sdk.